Between 27 June and 6 October 2018, a major exhibition, Voice & Vote: Women’s Place in Parliament, will be staged in Westminster Hall. Using both interactive features and historic exhibits, Voice & Vote will highlight the campaign for votes for women and the representation of women in the House of Commons and the House of Lords. More details on the Parliament website. In the UK, salaries are always quoted as gross and figuring out your take home net pay or gross to net salary is your responsibility. This site has calculated carefully all possible gross annual salaries to give you the net salary you will take home. The net salaries are calculated to show the exact amount you will take home after the income tax and national insurance contributions for 2018-2019. You can also check hourly wage calculator which is useful especially for students. Amidst the petabytes of press coverage of the World Cup, Politico has done the one useful thing of finding out where best to watch matches in the vicinity of Westminster (we assume those working in constituency offices have enough local knowledge to track down a screen). The match is live on BBC1, which means it will be on in pretty much all the pubs around Westminster including the Red Lion and the Westminster Arms. Strangers will have it on too — though possibly without sound — as will the Sports and Social. But if you want a big screen, you’ll have to go further afield — try the Barley Mow on Horseferry Road, Greenwood in Victoria (which has 19 screens) or Sports Bar & Grill at Waterloo station. The Porterhouse in Covent Garden was great for the last World Cup, with fans from all over the world flocking there. The Grafton Arms in Soho has an outdoor screen if you need to chain-smoke nervously. Whatever you do: Get there early — the pubs are going to be rammed. In fact, get there really early and check out England’s next opponents … Belgium vs. Panama kicks off at 4 p.m.
New analysis of 15 years of the Hansard Society‘s Audit of Political Engagement data shows how geography is an important factor in determining whether citizens feel they have influence on decision-making at the national level, even when other key factors that influence political engagement – such as education and social class – are taken into account. The full report is available to read on the Hansard Society website. 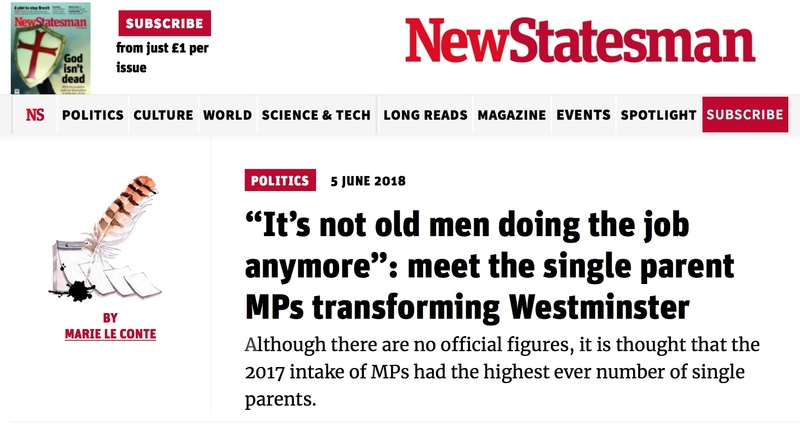 There’s an interesting article in this week’s New Statesman about the life at Westminster for single parent MPs – although there are no official figures, it is thought that the 2017 intake of MPs had the highest ever number of single parents. The full article is on the New Statesman website.